Learn about San Diego's' popular activities and culture. 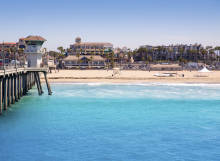 If living right next to one of the best beaches in the world isn't enough for you, San Diego offers top quality activities in just about every category you can imagine. Abundance of outdoor and water activities? Check. Top golf city? Check. Excellent restaurant and cultural scene? Check. You'd be hard pressed to find a more impressive city activities wise, but of course that ideal lifestyle comes at a cost. For those who crave outstanding Mexican food, it doesn't get much better than San Diego. Only a few miles from the Mexican border, the city serves up tamales, enchiladas, and fish tacos that are tough to beat. San Diego's fine dining and international offerings are impressive as well, with enough choices to satisfy any palate. Being a large city, the San Diego area has plenty to offer in terms of a cultural scene. The USS Midway Museum and the Maritime Museum of San Diego are both great options for those who have a naval or nautical interest, while the San Diego Museum of Art features both classic and contemporary pieces. For those interested in the performing arts, the Old Globe Theatre, La Jolla Playhouse, or National Comedy Theatre are all popular options for those looking to see a show. Didn't find what you're looking for? Ask the community a question.